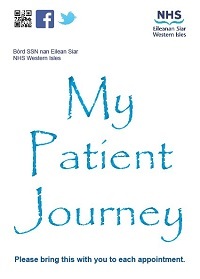 To celebrate Self Management Week 2015, NHS Western Isles are launching My Patient Journey, a personal guide to help patients, as well as their family or carers, to record information they may receive at clinical appointments. Many people find it difficult to process information they receive at clinical appointments, and after leaving, find they are unable to remember exactly what was discussed, or what the next stage of treatment may be. 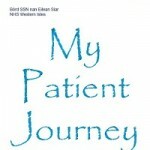 My Patient Journey, available at www.wihb.scot.nhs.uk/my-patient-journey, offers the patient the opportunity to record information received, to better understand and process, after they have left their appointment(s). The guide also enables the patient to create a unique one-stop information source on their specific health condition, which they can also share with family and loved ones, if they wish. Aimed for use at each appointment from diagnosis, the guide features handy sections for the patient to record their personal details, medical details, prescriptions and medications being taken, future appointment schedules, as well as space to record the information received at each appointment. Patients will also find this information invaluable if receiving care from a number of health professionals. The guide also discusses patients bringing a trusted friend or family member with them to appointments, which they may find invaluable in terms of support, and who could write down the information being received by health professionals. My Patient Journey has been developed in conjunction with patients and carers, and will be tested by services and patients until 31st March 2016.